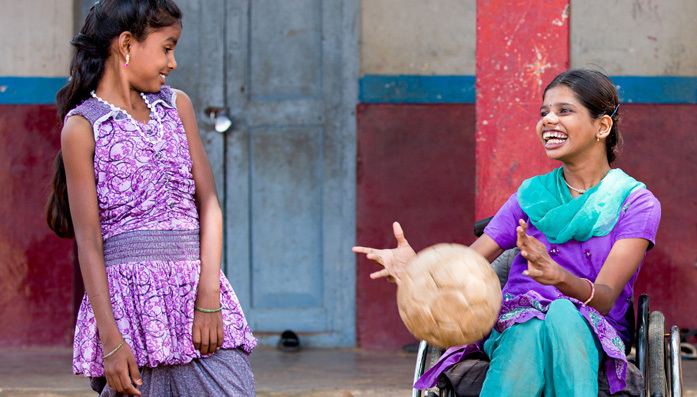 Shilpa is 13 and has cerebral palsy. She used to be unable to walk, crawl or sit up on her own. But after rehabilitation and support from Community Workers funded by CBM, she now attends her local school and a CBM-supported after-school club, which helps children with disabilities get the most out of school. Like all of the trained After-school Club Coordinators at this important project, the Coordinator at Shilpa’s club, Asha, has a disability herself. “When Shilpa first started coming”, she says, “she would sit alone and wouldn’t mingle with the other children”. So she encouraged her to interact with them. “I would get her to sit with other kids, and if she didn’t understand something I’d suggest she could ask the children around her to explain it to her”. It’s difficult for Shilpa to do activities that require a lot of movement, but she can do things where she’s able to sit. So Asha tries to run as many of such activities as possible, so that Shilpa will not feel different.“ Her confidence has really climbed; she’s also improved dramatically at catching things”, Asha reports with a smile. Shilpa was initially reluctant to go to the after-school club. But now she never misses a session, heading there straight from school. Today, she draws and paints, has learned to write her name, and participates in outdoor games along with her friends.